ZyXEL Communications Inc. announced its MIMO-N product line; a new series of Draft 802.11n-compliant wireless networking products. The MIMO-N series features throughput speeds of up to 300mbps and includes StreamEngine technology powered by Ubicom, as well as Network Magic's personal network management features from Pure NetworksTM. ZyXEL's MIMO-N product line delivers ultra fast wireless speeds to support multiple bandwidth-intensive applications, stability for high-definition video streaming, and extended range to provide consistent connectivity throughout the LAN. ZyXEL's MIMO-N series is a natural extension of their existing XtremeMIMO product line. Building on the success of their MIMO solutions ZyXEL has now introduced the first series of products based on EWC Draft 802.11n technology. "From video and audio streaming to online gaming, IPTV and VoIP services, the consumer appetite for more bandwidth and greater wireless range continues to grow," said Munira Brooks, senior vice president of sales, marketing and business development for ZyXEL. "Today's high bandwidth applications require connections that are not only fast and stable, but also have the extended range to maintain connectivity throughout the home or office. The MIMO-N series both meets and exceeds those needs." ZyXEL's MIMO-N series includes the NBG-415N Wireless Broadband Router, the NWD-170N Wireless Cardbus Adapter for laptops, and the NWD-370N Wireless PCI Adapter for desktops. The MIMO-N product line is powered by the Atheros Draft 802.11n XPAN chipset which provides throughput speeds of up to 300Mb/s and flexible deployment options. The NWD-370N comes with one 5dBi and two 2dBi removable antennas and the NBG-415N is packaged with three 2dBi removable antennas. Speed and coverage are bolstered by Draft 11n Wireless and MIMO Smart Antenna technology, which pinpoints the best method for connecting with a client. This increases performance by up to 8x over existing 802.11g, eliminates dead zones and increases range and throughput speeds for wireless network communications. Wi-Fi Multimedia for wireless QoS is also included which offers "traffic smoothing" for guaranteed performance when multiple applications are running simultaneously. In addition, the MIMO-N Wireless Broadband Router also features a USB port for Windows Connect Now (WCN), which makes it effortless to add new wireless devices, such as digital media players and printers, to an existing wireless network or to create a new network. The new router offers built-in StreamEngine technology powered by Ubicom which instantly prioritizes applications to reduce latency and boost network efficiency, making it ideal for Online gaming, VoIP, Internet radio and other high bandwidth applications. Pure Networks' Network Magic is an award winning software that makes it easy to configure and manage a home network and protects the network from would be intruders. The complete family of MIMO-N products will be available at the end of October through ZyXEL's approved channel partners and Retail/E-tail outlets. MSRP for the MIMO-N router product line is as follows: $159.99 for the Wireless Broadband Router (NBG-415N), $99.99 for the Wireless Cardbus Adapter (NWD-170N) and $119.99 for the Wireless PCI Adapter (NWD-370N). 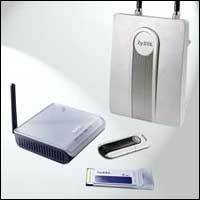 For more information about ZyXEL's WiMAX products and their full product line, please call 1-800-255-4101.